/ 10 Spectacular Summer Flower Ideas: Brighten Any Space Instantly! Do you love summer flowers but struggle with design ideas on how best to fill your garden with all those gorgeous blooms? Do you often visit your local garden center and see an abundance of available annuals and don’t know which ones you should take home? If you’re anything like me, you probably want them all, but settle on a random collection of different colors and varieties. Then you get them home and spend hours trying to figure out where to plant them or how best to group them together. Well, good news: growing colorful blooms in your garden can be rewarding and put a smile on your face every time you walk outside with a little help from us. We’ve found some great ideas to help you easily create beauty in your own garden. We hope you enjoy our selection of these 10 Spectacular Summer Flower Ideas. If you have a sunny spot on your front porch, this crate filled to the brim with pots of flowering annuals is sure to put a smile on the face of everyone who comes to visit. You can find a suitable crate at thrift stores or yard sales; some home stores even sell them too. Find one that you like and then buy some colorful blooms to arrange inside the crate. Try to get plants of different heights to create more impact. Put the taller ones in the middle and shorter ones around the outside. Consider some cascading flowers as well so that they fall over the sides of the crate. The crate in the photo features Delphiniums, Viburnum, Stock, Euphorbia, Sweet Williams plus a little green foliage. There’s nothing better than the sweet fragrance of Star Jasmine on a warm summer night. To create this lovely summer atmosphere in your garden, all you need to do is find a suitable wall and attach some climbing trellis. 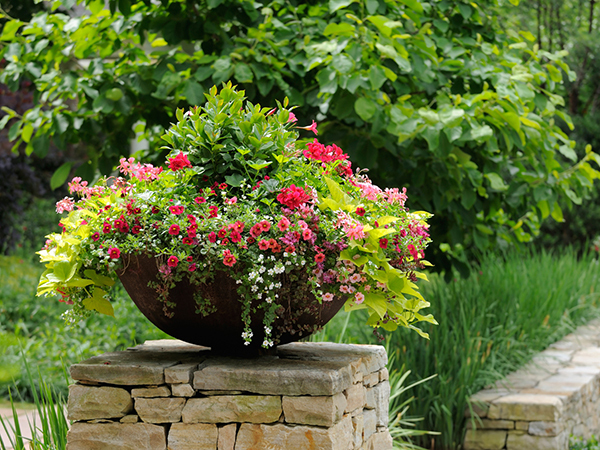 Pick out a beautiful planter which matches the exterior of your house or find a bright colored one to add more impact. Make sure the planter is large enough to allow plenty of room for the roots of your Star Jasmine to grow. 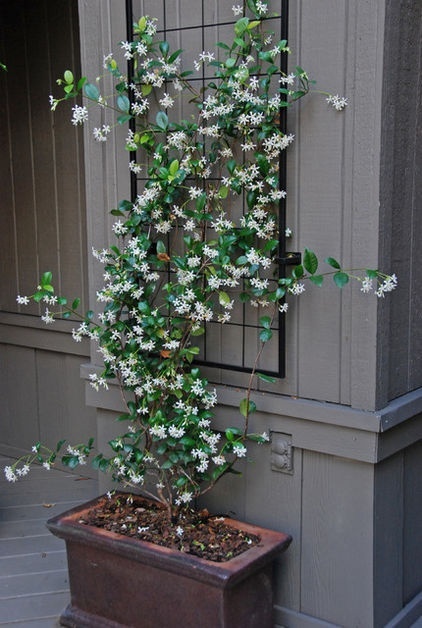 Then plant the jasmine and as it grows, attach it to the trellis so that you train it to grow up the wall. Make sure that you water it often as pots do tend to dry out quickly. Once it starts flowering, you’ll have your very own natural perfumery! This is so easy to create, and you can change the look with every change of season. All you need is some window boxes which you attach to the wall or window sill. Fill the boxes with some potting mix and plant your favorite annuals remembering to choose ones with different heights. You can choose complementary colors or mix it up for a more striking display. If you use water holding crystals in your potting mix, the boxes won’t dry out as quickly; then, as the seasons change you can plant different flowers and even have some themed displays for Christmas or Halloween. It’s not difficult to plant large pots of summer color if you follow a simple height rule. Firstly you want a tall variety of flower in the very middle. Make it something spectacular and eye catching. Next plant your filler plants, which are shorter, around the central plant. 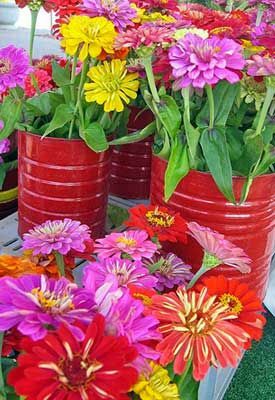 Then around the outside, plant flower varieties which will spill over the sides of the container. 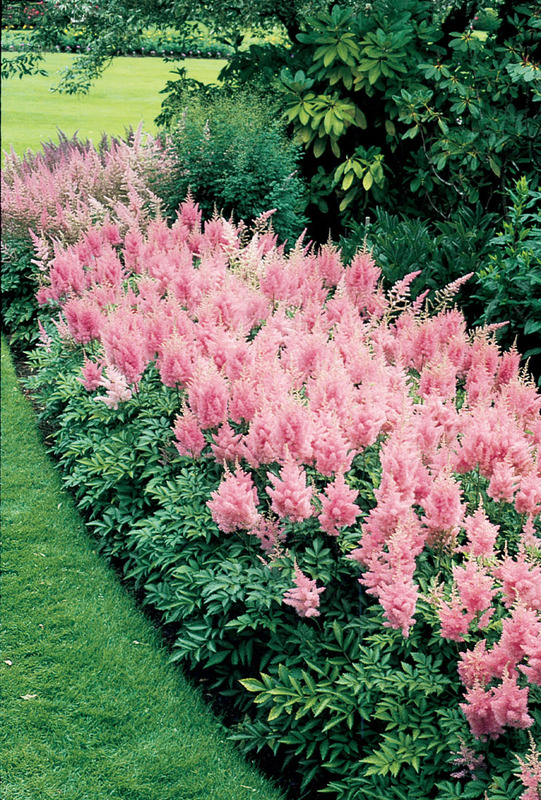 To create an instant display, purchase plants which are already flowering and plant them close together. Imagine the fun you’ll have planning and making these stunning pots of summer color! How stunning is this perennial border? You can create the same look in your garden by planting a single color border around your garden beds. Choose summer flower perennials like Salvia, dwarf Lavender or Russell Lupins and make sure you plant them close together, so they will fill out the border completely. Slightly taller varieties work best for this kind of display. Not only will you have a beautiful display of summer flowers, but the foliage will still look attractive when the perennials have stopped flowering. You can quickly brighten up any area of your fence or even a blank wall with baskets of summer flowers. Make the baskets all the same if you prefer a more formal look or mix them up for a complete splash of color. You can have fun with this project by deciding both the color scheme and the types of flowers that you want. You could even have one flower of the same color as a focal point in every pot and then have a mix of others around this theme. This is also great if you’re on a budget because you can just start with one or two and then keep adding to them. Zinnias are one of my favorite summer flowers. They’re so bright and cheerful. They’re also low-maintenance and will bloom all summer long. Plus they attract birds, butterflies, and other pollinators; and they’re very easy to grow. Just choose your favorite colors and plant them in among your garden beds or even in your vegetable garden. If you get the smaller growing varieties, you can even plant them in pots to add splashes of color to your outdoor living area. If you want gorgeous flowers in your garden all summer long without the fuss of needing to replant, you could plant perennials that will happily bloom more than once. 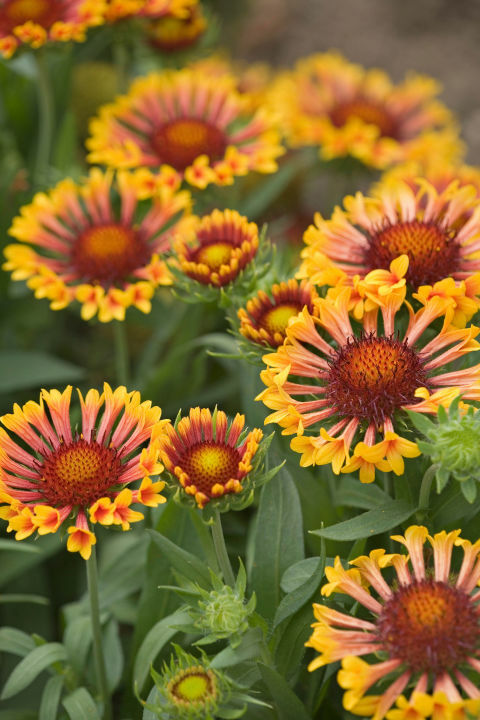 These include Blanket flowers, Columbines, Jacob’s Ladder, Coreopsis, Bellflowers, and Sage. Most of these plants will start flowering around April and May. Some will flower continuously, and others will give another flush of flowers a few weeks later especially if you deadhead them once the flowers are spent. 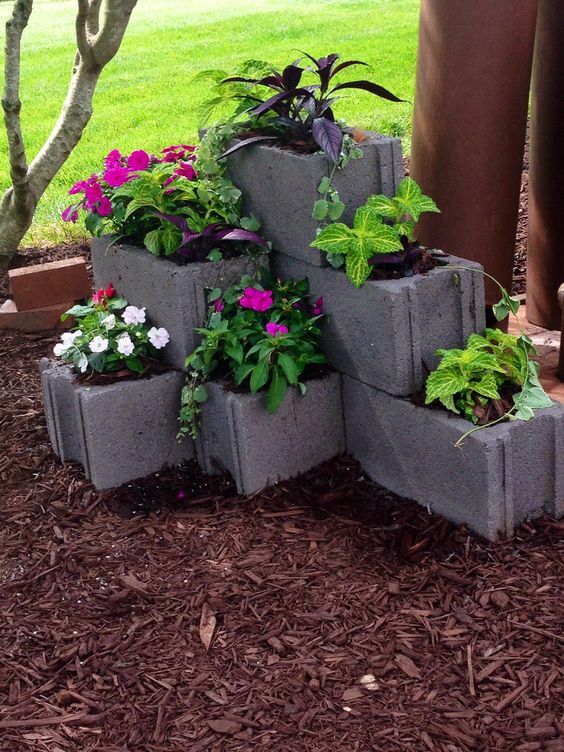 If you have some spare cinder block lying around or know where you can get some, then you can create this stunning floral display very easily. Just stack up the cinder blocks at different angles to create planting pockets. Fill these pockets with potting mix with some added water retaining crystals, then plant with your favorite annuals. The display in the photo has been planted up with shade loving plants, but you could just as easily choose bright colored sun lovers. This, of course, depends on where you’re going to situate your display. For even more color, you could even paint the cinder blocks first. 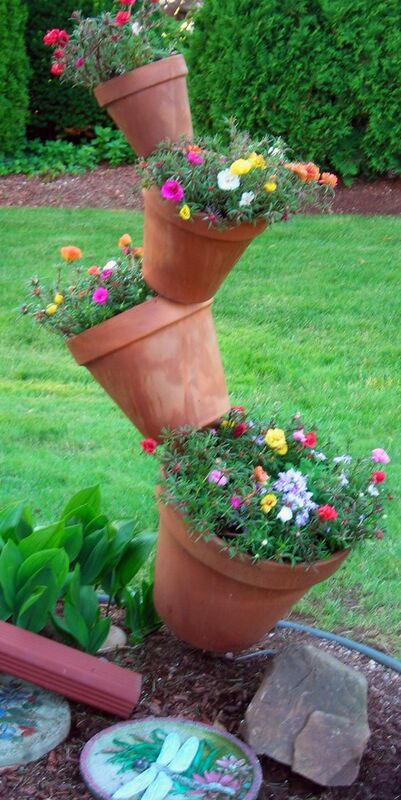 This flowering display is quite spectacular and seems to defy the laws of gravity. It’s quite simple to make. All you need is a collection of terracotta pots and a piece of rebar which you poke through the holes in the bottom of the pots. You then angle the pots in the position you want and add a little gorilla glue to the contact points. Fill the pots with colorful annuals and watch everyone’s surprised face when they see your display. We hope you liked our list of these 10 Spectacular Summer Flower Ideas. I think these ideas will give you lots of inspiration to get out into the garden and add some extra color with all the gorgeous summer blooms that are available. I’ve had a lot of fun putting this list together and will be trying some of these ideas in my garden too. If you’ve liked what you’ve seen, please leave a comment and share with your friends.